Much to the dissatisfaction of Starbucks and other major coffee sellers in California, the coffee industry will be required to put clear warnings indicating that coffee can cause cancer, according to a California judge’s ruling on March 28. The Council for Education and Research on Toxins sued the coffee industry for not providing labels on or near their products informing customers about the potential carcinogenic risks of drinking coffee. Starbucks fought the small non-profit in court and ultimately lost. LA County Superior Court Judge, Elihu Berle, ruled that Starbucks could not disprove the prosecutions’ claim that coffee can be harmful and that the bean roasting process is carcinogenic. The chemical responsible for the addition of coffee to a continually growing list of carcinogens is called Acrylamide. Acrylamide is found in many foods such as potatoes, breads, and cereal and is produced in the industrial process when cooking at high temperatures. Some case studies found that Acrylamide exposure has increased the risk of several types of cancer in rodents. 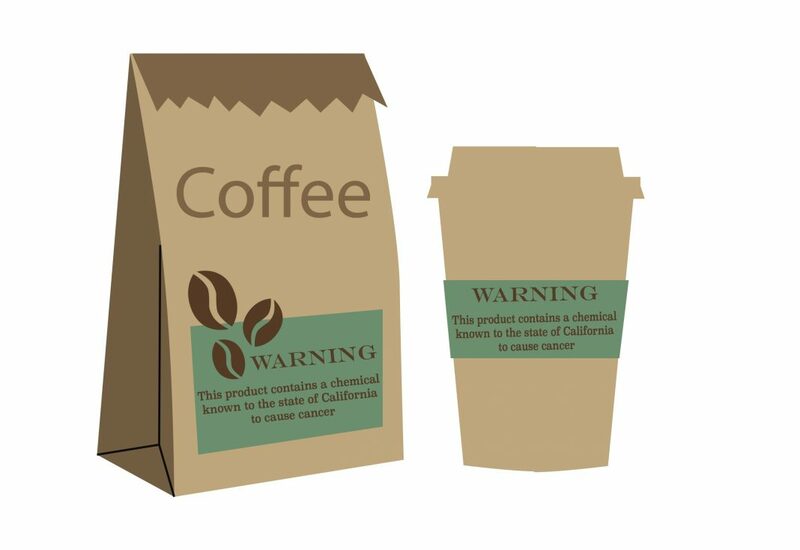 The fight for the warning label on coffee products comes from Prop. 65, which states that any products in California must clearly warn their consumers if their product could cause cancer or birth defects. The California proposition says that if companies don’t provide the appropriate warning for their customers, anyone can sue the industry on behalf of the state in an effort to force the companies to provide the labels. In return, one can collect a portion of the civil penalties. Natalie McCosker, a second-year Philosophy major and avid coffee drinker of two to three cups a day, weighed in on the decision of the judge and the science linking coffee with cancer in an interview with The Bottom Line. “I drink it because coffee and caffeine are a really strong study tool. That’s what I use when I know I have to get a lot of work done because it makes me a lot more productive,” McCosker said. “Knowing this information wouldn’t change how much coffee I drink […] at all because the chemical is prevalent at a very minimal amount and it seems like everything causes cancer,” McCosker continued. Many argue that although the proposition has good intentions to provide the public with more information, the influx of lawsuits in the interest of warning labels is counter-productive. They say that if products that are loosely tied to cancer have the same labels as products with real health risks, the weight of the label is lost. William Murray, the president and CEO of the National Coffee Association, commented on the news. “This lawsuit has made a mockery of Prop. 65, has confused consumers, and does nothing to improve public health,” Murray said. The shaky foundation of the case, coupled with loosely argued science behind the risks of coffee, has left many unphased in their caffeine driven rituals. “It really depends on [the product], and most of the time when I’m buying something that might cause cancer I’m not buying it because it’s healthy. Although if there were two brands, and one was more likely to cause cancer, I would probably buy the other brand,” McCosker said. While science seems to show the lack of substantive proof of the association between coffee and cancer, there surely isn’t enough research on causation and the subject in general. Although the public may not be deterred from the addictive assortments of lattes, americanos, and frappuccinos, there will be more morbid labels in Starbucks, Philz, and cafes all over California as the trend of extra caution with our food seems to pick up pace.